The differences between the way that business sees an issue, a system and the way that IT (or IS) sees the same issue or system is usually termed a divide. But it doesn’t have to be that way. We are seeing two sides of the same coin, and the coin needs both sides. I have to admit, I never much thought about this intersect; I am a user of the systems that IT finds, builds and supports. Sometimes those systems drive me mad because they don’t do what I expect them to do. IT should fix them, fix them now because I can’t complete my tasks. But then, as I was waiting for a diagnosis, I started to ask why and how and other questions. I changed from being irritated to curious. And then I was the business owner for the order process in an SAP conversion. Like most intersections, we don’t much think about them – they just are and we drive through noting only what we think pertains to us. Time after time. We tsk, tsk at the dysfunction that we see exists there, but it isn’t our place to repair it because we don’t own it. The thing with an intersect is that there is shared ownership, though. For any user to be successful with a system there is a how and a why within the procedure. The ‘how’ is the way that the system works and owned by IT. The ‘why’ is the business need for the system and owned by business. 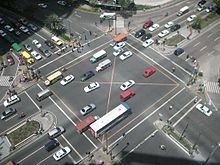 A successful intersection require collaboration and communication between business and IT from the moment that a system solution is identified. Looked at a different way, IT owns the system itself and business owns the content, the data. If the data isn’t clean, the system won’t work as intended. The system will be termed as broken. Creating powerful collaboration and communication between IT and business means a smoother intersection. Defining ownership at the start is the key; it doesn’t prevent the system from acting up, but it sure cuts down on the acrimony. How do IT and business get along in your office? I represent IS in our organization and while I agree with most everything, but I don’t like the idea of my department owning the systems we build. I like owning the technology used to build those systems, the way a contractor owns a backhoe. But, when we’re done, I’d like the uses to own the system. You make a good point, Dan. I think this is a topic to deep and broad to cover well in a blog post. And something that companies should put some effort into defining appropriately for their own needs. In many places there isn’t any discussion so instead of an intersection it is a dead space where efforts and projects go to die and frustrations mount. You strike me as too aware and conscientious to let that happen where you work. If I build on this piece, I will use your wording that it is the technology that is within the realm of IT/IS. Well, I do my best to get folks on either side to at least think a bit about looking for common ground whenever I can.